B&W image of a man seated at an office desk talking on the telephone. There is a display screen and keyboard on the desk. 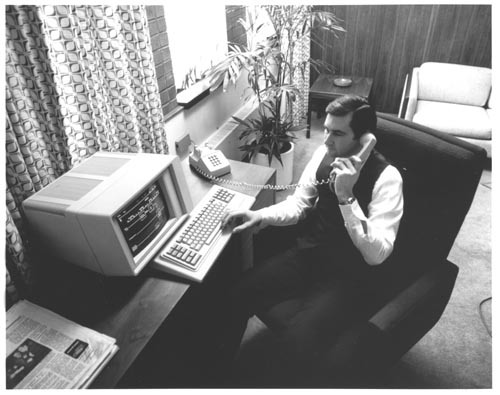 Verso Attached metadata: "The new SPERRYLINK office system from Sperry Univac brings together word processing, data processing, personal computing, electronic mail and voice services for all levels of office personnel. The system combines a wide variety of office functions into one easy-to-use deskstation. SPERRYLINK is one of the easiest office automation systems to operate available on the market today. It is also a simple matter to apply SPERRYLINK in using mathematical formulas for forms processing.